Somatic Stem Cell Regenerative Medicine Field | Healios K.K. Somatic stem cell regenerative medicine utilizes somatic stem cells, which are present in various tissues of the body, with the aim of developing new treatments for diseases for which the current standard of care may be limited or unavailable to many patients, or for which no effective treatments are currently available. There are many types of somatic stem cells, including neural stem cells, mesenchymal stem cells, and hematopoietic stem cells. While some stem cells can only differentiate into certain types of cells, others can differentiate into multiple types. In general, the range of cell types that somatic stem cells are able to differentiate into is more limited than that of iPS cells. Cells and tissue derived from iPSC based regenerative medicine are similar to a transplant in that internal organs or tissue are replaced with newly created cells, whereas somatic stem cell regenerative medicine is more akin to conventional medicine. In the latter approach, cells may behave like “living drugs”, where the cells promote healing or tissue repair, but are then cleared from the body. Healios began developing somatic stem cell regenerative medicine after entering into a license agreement with Athersys, Inc. (NASDAQ: ATHX, “Athersys”) in 2016. Athersys’ stem cell product MultiStem® (HLCM051) is a cell therapy product derived from human bone marrow of consenting adult donors. The clinical grade product is produced by first creating a master cell bank, then a working cell bank, and subsequently producing clinical doses for patients. Athersys holds the patent and licensing rights to this important technology, and has conducted multiple studies demonstrating that it exhibits a consistent safety profile and therapeutic potential. HLCM051 can be stored for long periods of time using cryopreservation, does not require immunosuppressants, and dissipates rather than accumulating within the body when administered by intravenous injection (drip). The cells are believed to promote healing and recovery through several important mechanisms. Through a license agreement with Athersys, Healios acquired the rights to develop and market this product in Japan. 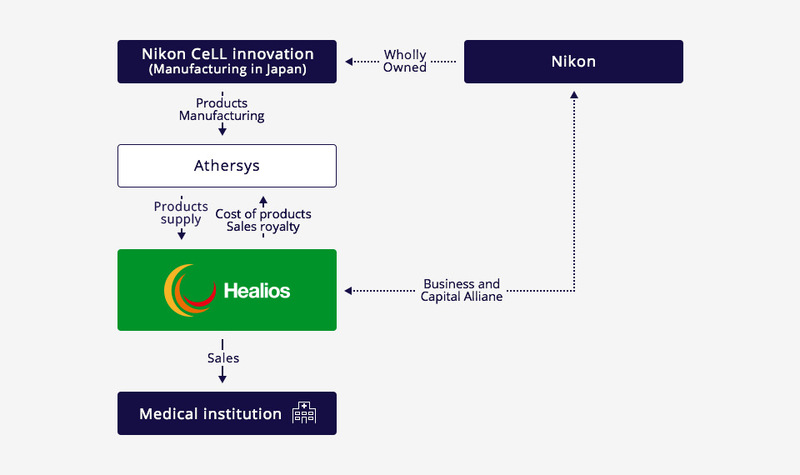 Athersys has retained production rights, but manufacturing in Japan has been contracted to Nikon CeLL innovation Co. Ltd. (wholly owned by Nikon Corporation). Please refer to the page Ischemic Stroke , Acute Respiratory Distress Syndrome(ARDS).